Lori has over 25 years experience in the world of dance as a performer and designer. She has extensive experience as a costume and set designer for film, television, and theatre. She held the position of resident Designer and Wardrobe Manager with Toronto Dance Theatre for 12 years. Her interests in design production led her to the IwB’s Interdisciplinary Design Strategy (IDS) Program and to working at the IwB itself. 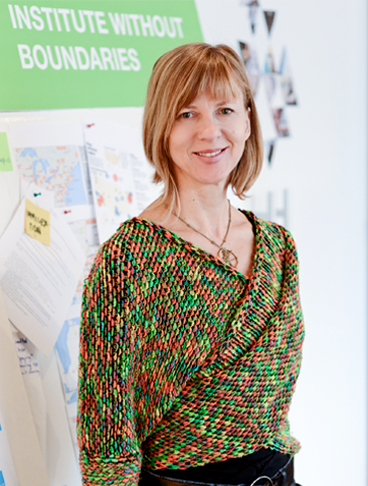 Lori is the Special Projects and Lab Coordinator for the School of Design and the IwB. She loves being in the middle of the design action, coordinating the IwB’s many projects, and working with an interdisciplinary staff of art and design practitioners. In addition, to her IDS training in design thinking and strategy, Lori holds a B.A in Communication Studies from Concordia University. She is an avid supporter of the performing arts, currently serving her second year as a member of the board of directors for Kaeja d’Dance, and deeply committed to architectural and urban design development in Toronto; she also consults for Endes Design. Lori has travelled widely through Asia, Europe and Central America and has lived and worked in Japan, Europe, India and Greece. She is planning an extensive cross country road trip on her Harley as soon as her daughters learn to ride. In her spare time, she loves to organize street festivals and pop up arts initiatives, as well as spend time on the Endes family farm.